Have another reason to love mashups: the Southwest Egg Rolls Recipe. 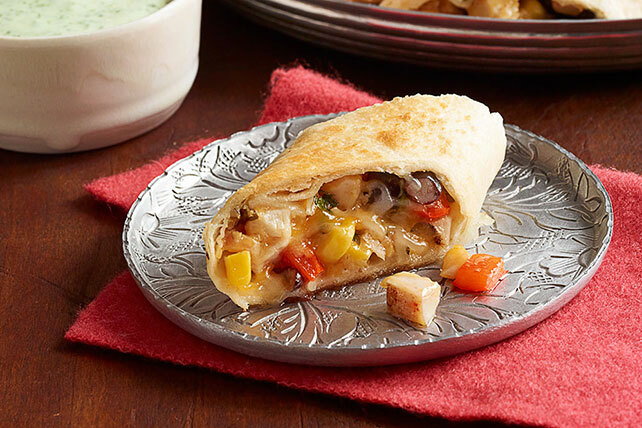 Here we've put a Southwestern-style spin on a favorite egg roll recipe. Mix dressing and 1/4 cup cilantro. Refrigerate until ready to use. Mix remaining cilantro, chicken, cheese, beans, corn, peppers and cumin; mix lightly. Spoon chicken mixture down centers of tortillas. Fold in opposite sides of each tortilla, then roll up, starting at bottom edge. Brush top edge with egg; press into egg roll to seal. Place, seam-sides down, on baking sheet; brush with oil. Bake 20 min. or until golden brown. Cut each diagonally into thirds. Serve with dressing mixture. Add 1 Tbsp. fresh lime juice to dressing mixture before refrigerating. Egg rolls can be assembled ahead of time. Do not brush with oil. Wrap individually in plastic wrap; refrigerate up to 24 hours. When ready to serve, brush with oil and bake as directed.